Nigerian James Okwuosa of Rangers International FC, currently number five in the Nigeria Premier League 2010-2011, is arguably one of the best, young central defenders playing in the domestic league. Okwuosa caught headlines in Nigeria back in October 2009, when he was included in the squad of the “Super Eagles”, the Nigeria national football team, for the match against Mozambique on 11.10.2009, a qualifier for the 2010 World Cup in South Africa. Okwuosa did not make it to the bench, but the inclusion nevertheless made him known to followers of Nigerian football. At the time, a few rounds into the Nigeria Premier League 2009-2010, Okwuosa was playing for modest club Lobi Stars FC from Makurdi, located in central Nigeria. I think it is fair to say that Okwuosa was a completely unknown player at the time. He was apparently signed before the season from second level side El-Kanemi Warriors from Maiduguri in north-eastern Nigeria. Despite his anonymity, Premier League debutant Okwuosa immediately impressed Super Eagles coach Shaibu Amodu. Okwuosa had another fan in Dominic Iorfa, his boss at Lobi Stars FC. Iorfa described Okwuosa as “a very good player who is capable of playing for any team in the world”. This is perhaps big words but Okwuosa had a wonderful season for Lobi Stars FC, becoming one of the “revelations of the season” according to SuperSport. Okwuosa was also part of the Nigeria B national football team in early 2010. As far as I know, Okwuosa scored two league goals during the season. After the Nigeria Premier League 2010-2011, Okwuosa left Lobi Stars FC and joined the more ambitious Rangers International FC, based in Enugu in southeastern Nigeria. Okwuosa is currently leading the defensive line of Rangers and has been largely impressive for his new club. 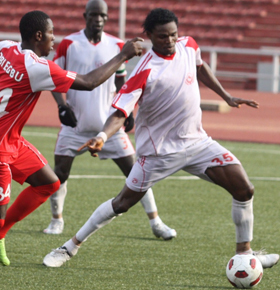 He has also been a candidate for the Nigeria U-23 national football team during the season. Okwuosa is described as a “big, tough-tackling defender” and an “athletic sweeper”. He is known for his calm, pace and aerial battles. Okwuosa also has great ball control, something he used effectively earlier this month when he played for the Nigeria team during the 2011 FIFA Beach Soccer World Cup in Ravenna, Italy. Okwuosa is registered with the birthdate 14.09.1990 in the Nigeria squad list for the Beach Soccer World Cup. According to other sources, that I find less trustworthy, Okwuosa is born 08.05.1987 or 16.12.1989. Personally, I think 14.09.1990 is correct, which implies that Okwuosa has just turned 21. Okwuosa is also known as “James Okwosa”, “James Ekwosa”, “James Ekwosah”, “James Ekosa” and often“James Okwosah”. I am pretty sure that “James Okwuosa” is the correct name. Okwuosa has stated that he dreams of playing overseas and I think it is highly probable that this will become a reality. The picture of Okwuosa is taken from MTN Football.